We all know that fish is good for us. 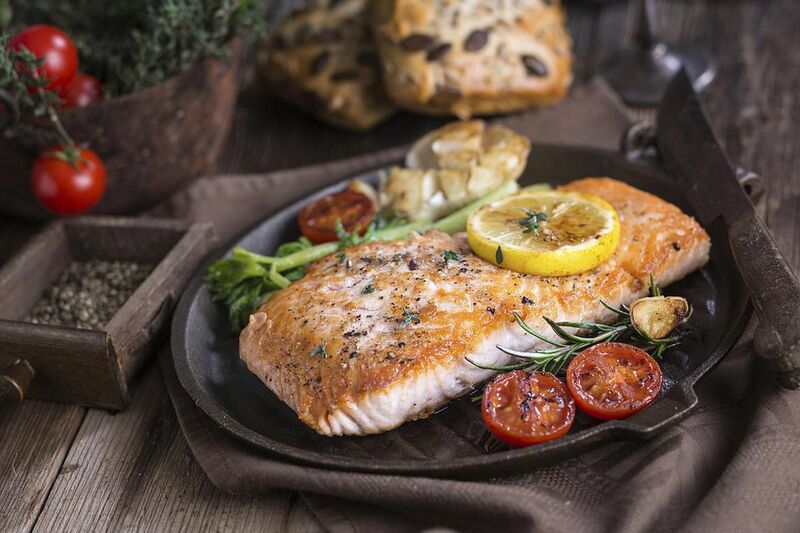 The fats in fish—especially fatty fish like salmon, tuna, and mackerel—are thought to help prevent heart disease, and can even aid in preventing diseases like Alzheimer's and strokes. But it seems that many people are afraid of cooking fish at home. Americans eat only about 15 pounds of fish per person per year, and we eat twice as much fish in restaurants than at home. Buying, storing, and cooking fish isn't difficult—it just requires a little knowledge. Follow these tips for selecting and cooking fish fillets and steaks and you will be preparing fish in your own kitchen more often. You need to use your nose and your eyes when choosing the freshest fish. Fresh fish smells sweet—you should feel that you're standing at the ocean's edge, breathing in the scent of the sea. Any fishy or strong flavors means the fish is past its prime, so do not buy it. Don't be shy—take a good whiff of the fish before you put it in your shopping cart. Then look at it. Whole fish should look like they were just pulled from the water—bright eyes and firm flesh are signs of freshness. Fish fillets or steaks should be firm and bright looking, with no brown spots or discoloration. Unless you live near a coast with a reliable supply of freshly caught fish, most fish that you buy will be sold frozen or previously frozen. Keep it frozen until you're ready to cook it. Fish can be thawed in the refrigerator, or under cold running water, or in the microwave. Be sure to cook it as soon as it's thawed. If you're lucky enough to get fresh fish, it should be stored in your refrigerator for only a day or two since it's very perishable. If you need to keep it any longer than that, wrap the fish well in freezer paper, place in a well-sealed plastic bag, and freeze it. What about bones? Many fish, including trout and salmon, have a double rib cage, so the fillets may have small pin bones. You can remove these by pressing the flesh with your fingers and removing the bones using a tweezer. It's possible to buy fillets of these species without pin bones, but they are generally much more expensive. There are several common methods used to cook fish, but no matter which you choose there's one important point to remember—leave it alone! When you place the fish in the pan or on the grill, let it cook undisturbed for two to four minutes before you touch it. The fish will develop a nice crust and will release perfectly when it's ready to turn. If you try to flip or move it too early, the fish will stick to the pan or grill grates and you'll be left with a mess. Marinating fish adds flavor and moisture to the flesh, but any marinating should be very brief. If fish flesh sits in acidic ingredients for more than 30 minutes, like the marinade in the recipe for honey orange fish fillets, the acid will begin to denature the delicate protein, and you'll have a mushy fish when it's cooked. The even richer flesh of salmon and tuna should only be marinated for about an hour. No matter which cooking method you use, there are several tips to keep in mind when cooking fish. The sturdier and fattier fish, such as grouper, salmon, tuna, swordfish, and shark, grill beautifully. Make sure that your grill is very clean and oil it lightly before adding the fish. Once the fish is on the grill, let it be until it is time to flip. For more delicate fish fillets, a grill basket will make grilling much easier. Just be sure to remove the fish from the basket as quickly as possible once it's done so it doesn't stick. You can also put a sheet of heavy-duty foil on the grill and cook the fish on that. Don't cover the grill as the fish is cooking—the cover will trap too much of the smoke and overseason the flesh. Broiled fish can be really delicious, especially if you season the fish well before cooking. Be sure to preheat the broiler before adding the fish, and make sure the fish is four to six inches away from the broiler. Watch carefully to make sure the fish isn't browning too much. Thinner fillets (1/2 inch) probably won't have to be turned over, but thicker fillets (1 inch) should be carefully turned halfway through cooking time. Broiled fish with mustard butter is a simple recipe, but the combination of butter, mustard, and lemon juice creates a sophisticated dish. Baking is one of the easiest ways to cook fish. Just follow the recipe instructions for cooking, covering, and standing times. Baked haddock with Parmesan, herbs, and cream is an easy dish of a light white fish topped with garlic breadcrumbs, and fish fillets with mushroom sauce is a great dish to try with almost any fillet—the creamy mushroom sauce adds flavor and moisture. Baking at a high oven temperature really concentrates the flavors of fish and helps the sugars on the surface caramelize for superior flavor. Roasting is essentially baking at temperatures above 400 F. You can season the fish with just about anything you like before roasting, like chili powder and cumin, as in this simple but delicious recipe for roasted salmon fillets. Using just a bit of olive oil and making sure to preheat the pan are the two tips for a perfectly sauteed piece of fish. Also, remember to let the fish cook undisturbed for two to three minutes to develop a nice crust. Be sure not to crowd the fish in the pan—cook it in batches rather than try to fit it all at once. The best way to saute thin fillets is to cook over medium-high heat for two to three minutes, then turn, cook for another minute or two, then remove the pan from heat and let the residual heat finish cooking the fish. Cook thick fillets five to six minutes on the first side, then reduce heat to medium and cook for four to five minutes longer. Deep-fried fish is usually battered, then gently lowered into 375 F oil and cooked for about four minutes per side, turning once and carefully. When frying, maintaining the oil temperature is crucial for achieving that crispy exteriorFish generally takes 10 minutes to cook per inch of thickness. Just to be sure it won't overcook, start checking the fish at seven to eight minutes. Steaming is the one method where this rule doesn't apply—if you steam your fish, check for doneness starting at about seven minutes. .Fish generally takes 10 minutes to cook per inch of thickness. Just to be sure it won't overcook, start checking the fish at seven to eight minutes. Steaming is the one method where this rule doesn't apply—if you steam your fish, check for doneness starting at about seven minutes. Making sure not to overcrowd the pan is one way to keep the temperature in check. A bamboo steamer is a great investment if you like this method of cooking fish. To steam fish, place water or stock in a large saucepan and add seasoning ingredients—anything from lemons to ginger will work. Bring the liquid to a simmer, place the fish in the steamer(s), and place over the simmering water. Do not let the liquid boil; this will cook the fish too quickly causing it to overcook in seconds. Fish is traditionally poached in a flavored liquid called a court bouillon, but just about any aromatic herb or vegetable can be used in the poaching liquid. There's one important rule for poaching: do not let the water boil! The liquid should be barely simmering. If the water boils the outside of the fish will overcook quickly. Cooking fish encased in parchment paper or foil is a wonderful way to get the best results out of your fish. The packet holds in the moisture, concentrates the flavor, and protects the delicate flesh. Follow the folding and cooking instructions carefully. The packets can be cooked in the oven or on the grill. The microwave oven will cook fish very well as long as you follow a few rules. First, make sure that you rotate the fish halfway through the cooking time so the fish cooks evenly. If the fillets are of uneven thickness, fold the thinner parts under each other so the fish is about the same thickness throughout. And standing time is very important—let the dish rest so the food finishes cooking. You may not think of using the crock pot when cooking fish, but there are actually some successful recipes. Most will call for adding the fish toward the end of cooking time since at high temperatures, one-inch pieces of fish will cook in about half an hour. Be sure to carefully follow the recipe instructions when cooking fish in a crockpot or slow cooker. The low, moist, and slow heat is perfect to cook salmon that is tender, moist, and so flavorful, like in this crockpot salmon with caramelized onions and carrots. And, of course, we are all familiar with using the slow cooker to make soup, so why not a fish chowder? Because fish have very little connective tissue and fat, they are quite delicate when cooked. A reliable doneness test is to check if the fish flakes. Insert a fork or knife gently into the thickest part of the fish and twist. The flesh should be opaque and begin to separate along the natural lines. There's a delicate balance between perfectly cooked fish and overcooked fish. Fish generally takes 10 minutes to cook per inch of thickness. Just to be sure it won't overcook, start checking the fish at seven to eight minutes. (Steaming is the one method where this rule doesn't apply—if you steam your fish, check for doneness starting at about seven minutes.) For best results, cook fish until it's almost done, then remove the pan from the oven, microwave, stovetop, or grill and let it stand for a few minutes to finish cooking. The pan will hold heat when it's removed from the heat source, continuing to cook the fish for several minutes. Some fish, especially tuna and salmon, can be served medium rare, meaning that the interior will still be firm and not flake. The choice is purely based on personal preference. With all the knowledge and cooking skills you've learned, you will master the art of cooking fish in no time. So maybe give a few different recipes a try, like lemon salmon pasta, an easy one-dish meal where lemon, leeks, bell peppers, and dill weed flavor the sauce. Or toasted fish sandwiches, with bacon and rich mustard accenting perfectly cooked fish. Not up for deep frying? These oven-fried fish fillets are coated with Cornflake crumbs, making for a crispy crust. Delicious with a homemade tartar sauce.